The Only Region On Earth Where Scientists Have Found No Evidence Of Active Microbial Life Is? Which Laboratory Boasts The Most Nobel Prize Winners? The McMurdo Dry Valleys are a series of large valleys in Antarctica that are snow-free due to a combination of the surrounding mountains and weather patterns that prevent snowfall and the flow of ice from nearby glaciers. The area, which looks far more like the surface of a hostile planet than a location here on Earth, is completely free of vegetation and incredibly inhospitable to life. So inhospitable, in fact, that when scientists visited the region in 2013 to conduct core-sample tests while searching for microbial life in the permafrost (a mock trial of techniques that may one day be used on Mars), they were surprised to find none at all. In the history of human exploration of the Earth, it was the first time that a sample test for microbial life yielded nothing. Given that the McMurdo Dry Valleys are about the closest thing on Earth there is to the harsh conditions found on other planets, that particular discovery doesn’t bode well for the exploration of our nearest neighbors in search of microbial life. After all, with an entire planet teeming with life, it would stand to reason that some microbial life, however scarred and hardened, would be locked away somewhere in the McMurdo Dry Valleys, but further exploration has continued to yield no positive results. 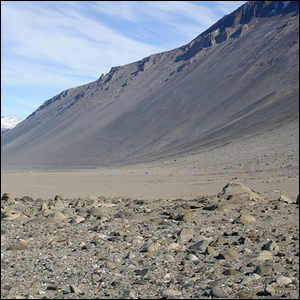 Bonus Trivia: The only native life found in the McMurdo Dry Valleys are endolithic photosynthetic bacteria that live in the relatively moist interior of rocks and anaerobic bacteria, with a metabolism based on iron and sulfur, that live under the Taylor Glacier. Image courtesy of NASA Astrobiology.